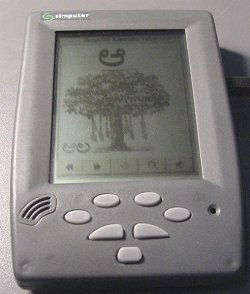 In 2000, the gang of four along with 3 others formed the Simputer Trust with the goal of producing hand-held, low power, smartcard-driven computing devices with Indian language interfaces. We all went down on our hands and feet and put a prototype in place (shown on the right) in just a few months with practically no external funding. The concept caught on and became widely popular. Our own commercial efforts to convert this concept to a commercial reality encountered limited success for various reasons (that story will be told some day). However the concept still remains alive and will hopefully inspire technologists to think about out-of-the-box solutions. Specifically, I worked on making the Simputer talk, i.e., via a speech synthesis system (Text to Speech) Dhvani that converts text in Hindi and Kannada to speech. The open source community is now carrying this forward. While there is still quite some distance to go before this becomes professional quality, I am glad we have made a start. Some day I hope to get back and spend a few months on this again.